tough warrior who may well have been at the center of what transpired next. In 1541 Harunobu suddenly rebelled, supported by a great many of his father's retainers. Nobutora submitted with little bloodshed and Harunobu exiled his father to Suruga. In this act he had the aid of the top Takeda retainers, many of whom held personal grudges against Nobutora or at least saw some gain in assisting the young usurper to power. Nobushige, for his part, seems to have borne his brother no ill will, and became a valued retainer. Sources conflict on what the exact events where which led to the replacement of Nobuhide with Harunobu. One version of events is that in the 5th month of 1541, Nobutora and Harunobu went on a campaign together to attack Unno Munetsuna in Shinano province. Unno Munetsuna lost and fled the province, and by the 4th day of the 6th month, they were on thier way back to Kai. However, on the 10th day of thier trip back to Kai province, Harunobu suddenly rebelled in a coup supported by his ashigaru and retainers, forcing Nobutora to flee to Suruga Province, and in to the care of his daughter's husband, Imagawa Yoshimoto. This generally follows the Koyogunkan, which essentialy states that Harunobu uncovered a plot by Nobutora to dispose of him and eventually give control of the Takeda clan to his younger brother, Nobushige. According to the Koyogunkan, Harunobu and loyal vassals drove Nobutora out of Kai province into Suruga. Another version of events states that during the 6th month of 1541, Harunobu and Nobutora travelled to Suruga province to visit upon Nobutora's son in law, Imagawa Yoshimoto. Little did Nobutora know, Shingen and Yoshimoto had a secret agreement, and upon arrival, Nobutora was forcibly retired to Suruga castle, and his son Harunobu was given control of the Takeda clan. Although what really happened is not clear, historians seem to be in agreement that Imagawa Yoshimoto had a hand in the removal of Nobutora. Regardless , Harunobu took control of the clan in what is often specifically cited as a 'bloodless coup'. Harunobu's chief ambition was the subjugation of Shinano but resistance in that quarter would prove fierce. A number of Shinano warlords, including Murakami Yoshikiyo (1510-1573), Ogasawara Nagatoki (1519-1583), Suwa Yorishige (? -1542), and Kiso Yoshiyasu, made a move designed to hopefully nip any further Takeda aggression in the bud. In April 1542 the four daimyo combined forces and marched to the border of Kai, encouraged by news that Harunobu was strengthening his defenses and preparing to make a stand in Fuchu. In fact, Harunobu's activities had been a ruse - far from waiting passively in Kai, Harunobu led his men out and caught the Shinano warriors by surprise, defeating them at Sezawa. Emboldened by the results of Sezawa, Harunobu made a drive into Shinano later that same year, focusing on the territory of the Suwa clan. He first took Uehara in a surprise attack and then moved on to the Suwa headquarters at Kuwahara, located 2 kilometers to the east. Caught completely off-balance, Suwa Yorishige had little choice but to surrender when Harunobu made a promise of safe conduct. Yorishige and his brother were taken to Kai where the Takeda general Itagaki Nobutaka arranged for their deaths; both Suwa were either made to commit suicide or were murdered outright. In 1551, Harunobu had adopted the name Shingen and a monk's habit, adding even more color to this up-and-coming Sengoku warlord, who was already known for his taste for women, penetrating judgment, skill at calligraphy, and wise government. Perhaps all that was now required was a great rival. This came, too, in the form of Uesugi Terutora of Echigo - the famed Kenshin. According to tradition, the defeated Murakami and Ogasawara presented themselves before Terutora and protested Shingen's aggressions. Terutora, uneasy at Shingen's northern expansion and obligated to the two refugees, took the field. That Murakami figures into the Uesugi's roll even many years later gives some substance to this belief, and, certainly, Terutora had reason to worry about Echigo's borders. In June and October 1553 The Takeda and Uesugi armies clashed near the Kawanakajima plain in northern Shinano, and while the two sides withdrew after a few rounds of inconclusive skirmishing, a legend was born. In total, the Takeda and Uesugi would face each other at the Kawanakajima five times (1554, 1555, 1557, 1561, 1564) and while not exactly the nearly annual staring matches as they are sometimes portrayed, only the 4th (1561) resulted in an all-out contest.4 In that engagement, both sides suffered heavy losses and while not individually decisive, those losses no doubt slowed both warlords down for some years. In particular, Shingen must have felt the loss of Nobushige and Yamamoto Kansuke, both killed in action at the battle. Internally, the Takeda suffered two grim moments within the span of five years. In 1560 Shingen had uncovered a plot against him led by his cousin Katanuma Nobumoto, whom he ordered put to death. In 1565, another plot came to light - this one headed by his own son Yoshinobu and Obu Toramasa. Tormasa was made to commit suicide, while Yoshinobu was confined to the Tokoji. Two years later Yoshinbou died, either from illness or, as many believe, because Shingen had forced him to commit suicide. The event left Shingen heirless for the time being and the Takeda retainers uneasy. By 1564, Shingen had subdued all of Shinano and shifted his attention to Kôzuke, where he took a number of castles from the Uesugi.5 For the next five years, he limited himself to raids and local conquests (including land grabs in mountainous Hida Province), concentrating on internal affairs. In the 1560's, Shingen's greatest achievement was the Fuji River damming project, the largest and most ambitious of his many innovative domestic endeavors. The benefit of the Fuji River project far-outlived its mastermind, and is ranked as one of the greatest domestic initiatives of the 16th Century. By 1568, the Takeda army was on the move again, this time to the south against the faltering Imagawa. The daimyô of that clan was Ujizane, the incompetent son of the late Imagawa Yoshimoto (killed in 1560 by Oda Nobunaga), whose political ineptness had already cost the Imagawa their Matsudaira (Tokugawa) vassals and Mikawa province. Years before, Shingen's son Yoshinobu had married Ujizane's sister but after the suicide of the former in 1567, relations between the families had grown sour. It would appear that Shingen and Tokugawa Ieyasu struck up a deal whereby the two would split up the Imagawa's remaining lands (Tôtômi and Suruga), an agreement that in the event quickly fell through. In addition, the Hôjô of Sagami took a dim view to this shift in the balance of power, and sent troops to defy Shingen, which they did with varying degrees of success for a year or so. In 1569 Shingen responded by invading Sagami and besieging Odawara (the Hôjô's capital). While this effort was quite short-lived (lasting around a week), the Takeda army did manage to crush an attempt at an ambush by the Hôjô at Mimasetoge on their way back to Kai. 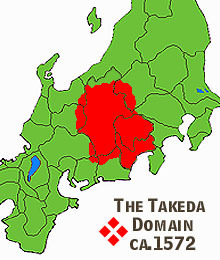 Thus, in 1570, the Takeda's lands now included Kai, Shinano, Suruga, and pieces of Kozuke, Tôtômi, and Hida. Shingen, at 49, was something more than a regional power - he was the most important warlord east of Mino, and the one who was in a position to derail Oda Nobunaga's march to national hegemony. Shingen alone possessed the strategic position, the generalship, and the solid retainer band necessary. In 1570, the formidable Hôjô Ujiyasu died and his heir, Ujimasa, quickly made peace with Shingen, an act that might have all but assured the ultimate destruction of Tokugawa Ieyasu had not Shingen died in 1573.6 In the meantime, the Takeda and Oda, after an abortive diplomatic courtship designed to check the Uesugi, initiated a war of words, possibly with the shogun, Ashikaga Yoshiaki, at the center of the storm. Shingen stepped up the pressure against Tokugawa, and in 1572 launched an attack into Tôtômi that resulted in the capture of Futamata. The following January, Shingen returned to the province and enticed Tokugawa Ieyasu to come out and fight. The Battle of Mikatagahara, conducted on 6 January to the north of Hamamatsu, ended in a near-complete defeat for Ieyasu (and the allied Oda troops present).7 Though often presented as the opening moves in a march on Kyôto, Shingen's intentions were no doubt more conservative. He probably aimed to test the responses of both Ieyasu and Nobunaga and deal the two a defeat if possible. Either way, within days of winning the battle, he recieved news that Asakura Yoshikage had elected not to take the field against Nobunaga at this time. Shingen is reported to have been displeased, and might have counted on Yoshikage - and Asai Nagamasa - to keep Nobunaga preoccupied. This may have played a role in his decision to strike camp and return to Kai - thus granting the bloodied Tokugawa a reprieve. Unfortunately, time ran out on the man who had come to epitomize the best and, in some ways, the worst qualities of the Sengoku warlord. In 1573, while laying siege to Noda Castle in Mikawa, Shingen was either wounded by a sniper or fell sick (possibly with TB); a point modern scholars are divided on. He died at Kobama in Shinano in May of 1573, to be succeded by his fourth son, Takeda Katsuyori. Shingen had been a warlord of great domestic skill and competent military leadership. He was a complicated figure, at times utterly cruel. Earlier in his life, he had forced Suwa Yorishige to commit suicide (or had him murdered) after the two warlords had signed a peace treaty, and then proceeded to take Suwa's daughter as a mistress, ignoring the fact that she was techincally his own niece. In 1565, as mentioned above, he ordered his own son, Yoshinobu, confined to a temple and evidently made him commit suicide for treasonous activity, as well as the man who had once been his guardian, Obu Toramasa. His domestic policies demonstrate the duality of Takeda Shingen. On one hand, he kept two iron cauldrons on hand to boil alive certain criminals (a practice considered sufficiently cruel enough to provoke Tokugawa Ieyasu to have the cauldrons destroyed years later). On the other, he did away with corporal punishment for most minor offences, instituting in it's place a system of fines - an act that earned him considerable praise from the peasants and townspeople of Kai. Shingen's law was not considered overly harsh, and his was one of the few Sengoku Period administrations prior to 1582 to tax most of his subjects evenly (most exempted powerful samurai families and/or religious establishments) and with the option of payment in either gold or rice (a forerunner, in some ways, to the later Kandaka system). Perhaps the greatest praise paid Shingen was by Tokugawa Ieyasu himself. 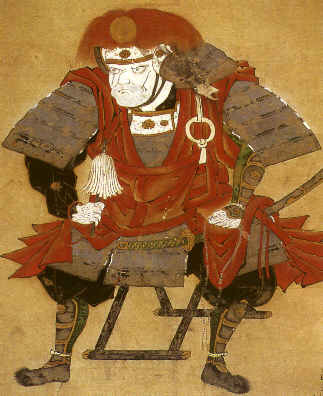 Following the defeat of Katsuyori in 1582 and the death of Oda Nobunaga, Ieyasu assumed control of Kai, and borrowed freely from Shingen's style and techniques of governance, which he later included in his model for the Tokugawa Shôgunate. 1The Takeda clan had been powerful in Kai from the 12th Century, when Takeda Nobuyoshi (a grandson of Minamoto Yoshiie's brother Yoshimitsu, 1138-1186) had sided with Minamoto Yoritomo during the Gempei War. The Takeda's power had increased in the Ashikaga era, and branches became strong in Aki and Wakasa, as well as Kai. Mori Motonari eventually defeated the Aki branch in 1516; the Wakasa Takeda became vassals of the Asakura by 1560 and faded from history. 2Katsuchiyo can be translated as '1000 Victories in Succession', or, as Hiroaki Sato does in Legends of the Samurai, 'Victory Forever'. 3The fallen generals in question were Amari Torayasu and Itagaki Nobutaka, both of whom were considered first-rate retainers by the Takeda clan. Shingen managed to score a counter-victory against the Ogasawara at Shiojiritoge the same year that restored the initiative to the Takeda. 4Shingen also had to keep an eye on both the Imagawa and Hôjô clans to his south and southeast, which no doubt contributed to the caution he generally displayed when facing Kenshin at Kawanakajima. During the 1550's the Takeda, Imagawa, and Hôjô became involved in a series of alliances and counter-alliances that occasionally resulted in minor forays into one another's territory. These almost always came to an end when the clan that happened to hold third-party status at the time declared for the attacked, thus maintaining he balance. 5These included Kuragano (1565) and Minowa (1566). The latter was taken from the Nagano family and provided a starting point for the career of Kamiizumi Hidetsuna, who declined a personal invitation by Shingen to join the Takeda. He did accept the character 'Nobu' from Shingen's name and went off to become legendary as the swordsman Kamiizumi Nobutsuna. 6Conflict with Tokugawa Ieyasu began soon after Takeda consolidated his hold on Suruga, and was exacerbated when Ieyasu moved his headquarters to Hamamatsu in Tôtômi in 1570. Shingen considered this a provocative move, and even Nobunaga urged his impetuous ally to shift his standard back to Mikawa. Tokugawa, far from pulling back, opened up talks with Uesugi Kenshin, inflaming the situation even more and providing the Takeda with ample excuses to attack. 7The Battle of Mikatagahara left 1,180 of Tokugawa's men dead while the Takeda lost somewhat less then 400. The majority of Takeda's losses came about as the result of a bold raid ordered that same night by Tokugawa and led by Okubo Tadayo and Amano Yasukage. This action is sometimes known as the Battle of Saigadake. The Oda men present were under the command of Takigawa Kazumasu, Hirade Norihide, and Sakuma Nobumori - of these only Hirade, who was killed, stood before the Takeda onslaught. This battle has sometimes been recorded as occuring in December of 1572; this does not account, however, for the difference in the Japanese lunar calender. 8Suzuki, Zen and Japanese Culture pg. 82. The 'she' in the passage is a reference to life, or reality.